Three brothers, one death, a fenceline stretching to the horizon. For readers who loved The Dry and Force of Nature, Jane Harper once again creates a powerful story of suspense, set against a dazzling landscape. Three brothers, one death, a fenceline stretching to the horizon. Two brothers meet at the border of their vast cattle properties under the unrelenting sun of outback Queensland. They are at the stockman's grave, a landmark so old, no one can remember who is buried there. But today, the scant shadow it casts was the last hope for their middle brother, Cameron. The Bright family's quiet existence is thrown into grief and anguish. Something had been troubling Cam. Did he lose hope and walk to his death? 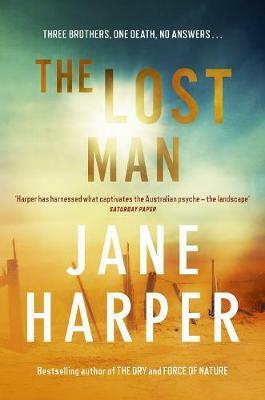 Because if he didn't, the isolation of the outback leaves few suspects... For readers who loved The Dry and Force of Nature, Jane Harper has once again created a powerful story of suspense, set against a dazzling landscape. Jane Harper is the author of the international bestsellers The Dry and Force of Nature. Her books are published in more than 36 territories worldwide, with film rights sold to Reese Witherspoon and Bruna Papandrea. Jane has won numerous top awards including the Australian Book Industry Awards Book of the Year, the Australian Indie Awards Book of the Year, the CWA Gold Dagger Award for Best Crime Novel, and the British Book Awards Crime and Thriller Book of the Year. Jane worked as a print journalist for thirteen years both in Australia and the UK, and now lives in Melbourne with her husband and daughter.